Eldon is guaranteed to have one wish come true, but with chaos surrounding him, how is he supposed to choose? In the sandy Mojave Desert, Madison is a small town on the road between nothing and nowhere. But Eldon wouldn't want to live anywhere else, because in Madison, everyone gets one wish-and that wish always comes true. Some people wish for money, some people wish for love, but Eldon has seen how wishes have broken the people around him. And with the lives of his family and friends in chaos, he's left with more questions than answers. Can he make their lives better? How can he be happy if the people around him aren't? And what hope is there for any of them if happiness isn't an achievable dream? Doubts build, leading Eldon to a more outlandish and scary thought: maybe you can't wish for happiness.maybe, just maybe, you have to make it for yourself. 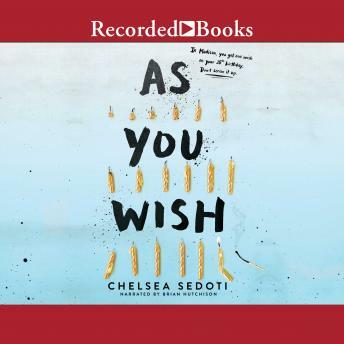 Author bio: Chelsea Sedoti lives in Las Vegas, Nevada. Her short stories have been published in Pantheon Magazine and Balloons Lit Journal. She went to school for film and worked as a videographer before switching to writing. Chelsea spends her time rock climbing, baking, and exploring the Mojave Desert. Visit chelseasedoti.com. I knew going into this book that it would be an easy listen and it was. It was surprisingly interesting and unique though. I really liked the narrator which surprised me because I don't normally like American accents. I also don't normally like male protagonists but this one was so interesting and somehow universal. I listened to it over three days... I'll kind of miss it but I'm happy with the ending.